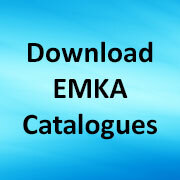 For many years the EMKA slogan has been “Everything but the Enclosure” – intended to convey our commitment to providing enclosure hardware so that specialist metal workers and panel makers can manufacture high quality enclosures which suit the needs of our electrical controls industry and the many other related industries who share the same physical protection criteria for personnel and equipment – “encapsulated” as it were in the IP rating system. To this end we have developed a very focused modular approach to quarter turn locks, also for hinges as well as gasket sealing strips – together these form a complete component package for wall mounted enclosures, encompassing both lay-on doors and recessed construction, with the possibility for sealing levels from IP44 to IP55 and IP66. This means that single units or production runs of wall mounted enclosures or cabinets can be produced efficiently and economically without the need to invest in expensive equipment or making an inflexible commitment to standard sizes of housing even for very special sizes or where sealing critera call for specialist gasket profiles. Share the post "Everything but the wall mounted enclosure"